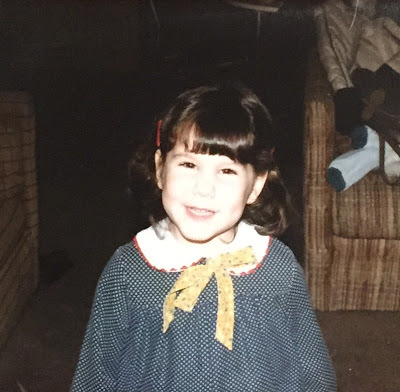 Showing off the signature bangs of my childhood, circa 1983. Also, I really loved that dress. Until I turned 18, I had bangs. Really and truly ... I had them for my entire childhood and young adult life. Now, this might not seem like such a big deal -- but because my hair is the way it is (curly, wavy and straight all at the same time, all while being thick and coarse), bangs were a CHALLENGE. Now, the photo above, which was taken when I was maybe three, shows my bangs on a pretty good day. They were thick and blunt cut (as they always were for me -- no wispy fringe here), and, except for a little section on one side that decided to do its own thing, all pretty much laid flat against my forehead. 1) There was the time in 7th grade that, while blowdrying my hair before a friend's Bat Mitzvah, I decided to cut my own bangs. While they were wet. All I can say about that one is, OOPS. Before I knew it, they had dried and shrunken up to right below my hairline. 2) Once I got into high school, my bangs really started having a mind of their own. Even though I blowdried them immediately after getting out of the shower, they would still puff up and start turning inward instead of lying flat. And, keep in mind that my bangs were always on the thick, blunt side, so they were ... um ... interesting looking, to say the least. Once I hit my senior year of high school and saw the way they acted in my senior pictures, I knew something had to change. I always really liked having bangs, even with the struggles of getting them to look and act the way I wanted them to, but the time had come for me to move on. By the end of that year, I had grown them out to match the rest of my bob, which I then promptly chopped off into a pixie cut before I started college. And now? No bangs for me. I have happily kept away from long fringe, sideswept bangs, the whole nine yards. I'm good with an exposed forehead. But, I do have to say, I miss the cute factor they provided when I was two years old. Did you ever have bangs? Did you like them? Let me know in the comments! I had the "Diana" cut until I went to university, and grew out my hair for the first time then! But I've always had bangs with long hair, I dunno why. Not very prominent ones, just a couple of wisps here and there. Can't live without them! I love this picture of you! I had bangs at one point when I was a kid, but I have naturally curly hair and tend to either have it layered or just one length. I had bangs when I was little but then grew them out in grade school and didn't have them again until I was 21. Now, at 27, they are grown out again. I still toy with the idea of having bangs again. They are just too much work which is the only thing keeping me from it. I did have bangs, but my hair is thin and oh so straight, so the hair would just lay on my forehead looking.. dead. They look cute on you as a kid! You're so cute! I never really had bangs when I was younger, but I did go through a phase late high school-college where I sported Betty Page type baby bangs. They're lot of work to keep up with, but I do miss them from time to time. I just got a fringe cut today because I was hating my exposed forehead! I also cut my own bangs! Too funny. You are sooooo cute!!!! Whenever I feel like looking "youthful", I trim my own bangs. Oh yes! I had BANGS!!! My mom used to cut them for me and I remember hating having to sit still because it felt like she took FOR-EV-ERR! Not to mention getting little pieces of cut hair in my mouth. Don't miss that one bit LOL. I got bangs again last year but grew them out and now I have them again but not a full forehead! I had bangs when I was very little but my hair is super curly so it was always an adventure. I got rid of them when I was old enough to have to do my own hair haha. I had bangs probably until I turned 17 because I though they were cute.